Men should wear a kippah or a hat. Women should be modestly dressed, and married women should wear a head covering that covers their hair entirely (these are available in the welcome center). It is customary not to wear leather shoes in the Ohel (slippers are available in the welcome center). 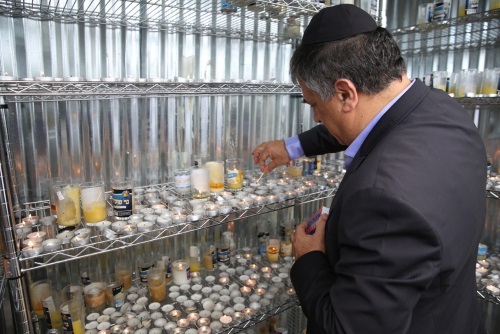 Candles may be lit on the designated shelves in the Ohel's ante-chamber (candles are available in the welcome center). There are separate entrances for men and women. Some have the custom to knock on the door before entering, as a sign of respect. It is customary to verbally read one's letter (albeit quietly), then tear it up and place it in the enclosed area. Customary prayers include the Ma'aneh Lashon and Psalms. Suggested chapters of Psalms include the Rebbe's chapter and the chapter corresponding to one's age (e.g., Chapter 31 for someone aged 30). There are Ma'aneh Lashons and books of Psalms in the Ohel's ante-chamber. As a sign of respect, it is customary to exit the Ohel walking backwards. The concept of not wearing (leather) shoes at a holy place can be found in the Midrash Shemot Rabah 2:13 which states that just as Moses took off his shoes so too did Yehoshua and the kohanim in the Holy Temple take off their shoes. The Midrash Pirkei D'rabbi Eliezer 40 states simply " that from the story of Moses we learn that in every holy place, one should not wear shoes." The Rabbi David Luria - Radal - in his commentary to the Pirkei D'rabbi Eliezer explains that this does not apply to a synagogue. While the Rebbe wore shoes, they were not made out of leather. The issue is specifically leather (the commentaries explain that we find the same thing in the holy Temple, you couldn't go there with leather shoes, when the kohanim actually served then they had to be completely barefoot, but that was for a separate reason (see Shu"t Divrei Yatziv, Choshen Mishpat 91 and Toras Sheliema Shemos 3:90)). One of the explanations given (see Shalah quoting the maharshal) as to why specifically leather is that there are four levels of existence in the world: Inanimate objects, plant life, animal life, and man. Normally, a Jew must understand that the human being is on top and everything below him is there to serve him and help him fulfill his divine service. In other words, the world was created in a way that plants and animals should serve human beings. This is symbolized by putting on shoes, made of leather (the skin of animals). The message to man is "You are on top of everything -- you are in charge." However, when one is in a holy place, he must remove his shoes. For while wearing shoes demonstrates to man’s superiority and that he is “on top of the pyramid,” In the Presence of the divine, there is a Higher Force and man must clearly recognize that he or she is no longer "in charge". This is demonstrated by removing his shoes. 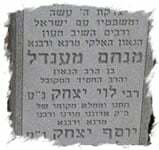 The resting place of a tzadik is considered a “holy place” (see Maharil –Minhagim- hilchot Taanit). Is there a source from jewish law not to wear leather shoes at the tzion besides the burning bush reference? Which seems to be a little ambiguous as typically jews do not make comparisons straight from the bible without some rabbinic literature backing. Also using jewish custom as a reference there does not seem to be any such custom even for the holiest of jewish sites such as the Kotel or other great righteous Rabbis graves even great prophets of the bible. Lastly it seems that the Rebbe himself wore shoes at the burial sight of his father in law which he so often visited and obviously held in such high esteem. Any help to find a source would be very helpful. "I Will Bring it to the Ohel"
Did you know the Rebbe?